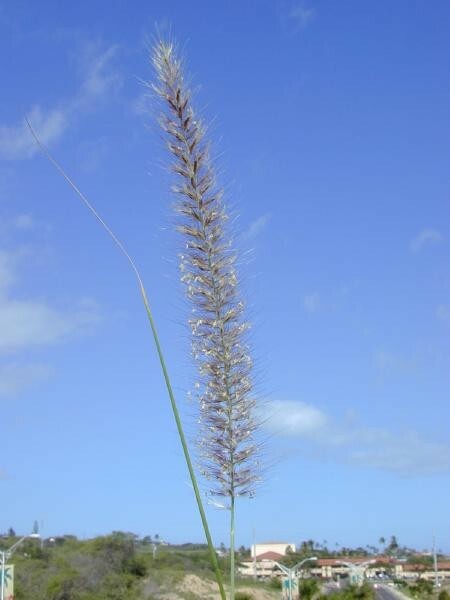 Cenchrus setaceus (Pennisetum setaceum) was introduced to the United States as an ornamental grass. It reproduces high numbers of wind-dispersed seeds that have spread outside of planted areas. C. setaceus is a desert plant that is prevalent along roadsides, washes and canyons where the annual rainfall is less than 127cm. C. setaceus interferes with natural fire regimes and competes with native species for limited resources. 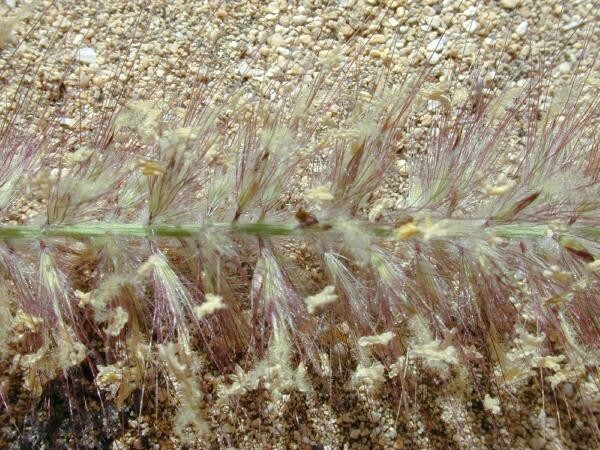 Benton (1998) describes \"Cenchrus setaceus (Pennisetum setaceum) as an attractive perennial grass with a densely clumped growth form and erect stems that grow up to 1 metre high. The small flowers of C. setaceus are grouped in pink or purple, bristly, upright inflorescences 15-38cm inches long\" (inflorescences may also be cream coloured). Fruits are small, dry achenes adorned with long showy bristles.Leaf colouration depends on water availability; in Hawai‘I leaves are typically green in winter and may be brown in summer. According to Benton (1998), \"Pennisetum setaceum (Cenchrus setaceus) has been introduced to many parts of the world as an ornamental grass.\"
According to Benton (1998), \"Pennisetum setaceum (Cenchrus setaceus) invades many types of natural areas, from bare lava flows to rangelands, in Hawaii. It has a wide elevational range but is limited to areas with a median annual rainfall of less than 127cm. In southern California, C. setaceus invades grasslands, deserts, canyons and roadsides.\" PESC (2002) writes that C. setaceus is commonly seen spreading along roadsides, washes, and canyons in Arizona. According to Devender et al. (1997), P. setaceum is a common landscape ornamental in southern Arizona.According to Benton (1998), seeds may be dispersed by livestock.According to Benton (1998), seeds may be dispersed by humans.According to Benton (1998), seeds may be dispersed by vehicles. Recommended citation: Global Invasive Species Database (2019) Species profile: Cenchrus setaceus. Downloaded from http://www.iucngisd.org/gisd/species.php?sc=309 on 20-04-2019. Cenchrus setaceus (Pennisetum setaceum) requires full sun to grow vigourously; in dry and open environments fountain grass is a highly aggressive, fire-adapted colonizer that readily outcompetes native plants, it rapidly re-establishes after burning. Fountain grass raises fuel loads, which increases the intensity and spread of a fire, and result in severe damage to native, dry forest species adapted to less extreme fire regimes.\" PESC (2002) states that these fires create even more space for C. setaceus and other invasive species. \"C. setaceus reduce the space available for native species and compete with them for scarce water and nutrients.\" Benton goes on to say that \"C. setaceus is a poor pasture grass and a serious weed in many dry habitats.\"
In wet areas, however, it is outcompeted by other grasses. Preventative measures: Planting native species after removal of the invasive will help prevent re-establishment of C. setaceus. Monitoring the area for seedlings and removing them is a good practice as they are easy to pull up when young. 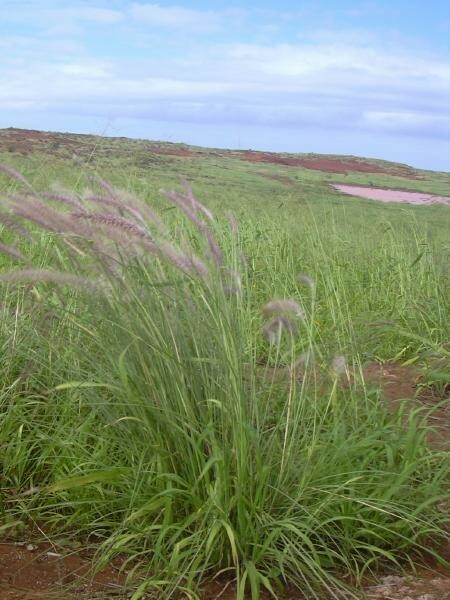 A Risk Assessment of Cenchrus setaceus (Pennisetum setaceum) for Hawai‘I and other Pacific islands was prepared by Dr. Curtis Daehler (UH Botany) with funding from the Kaulunani Urban Forestry Program and US Forest Service. The alien plant screening system is derived from Pheloung et al. (1999) with minor modifications for use in Pacific islands (Daehler et al. 2004). The result is a score of 26 and a recommendation of: \"Likely to cause significant ecological or economic harm in Hawai‘I and on other Pacific Islands as determined by a high WRA score, which is based on published sources describing species biology and behaviour in Hawai‘I and/or other parts of the world.\"
Physical: According to Benton (1998), \"the long-lived seeds of fountain grass make its control extremely difficult. Small infestations may be managed by uprooting plants by hand and destroying the inflorescences in order to prevent seed dispersal. Removal by hand may need to be repeated several times per year.\" PESC (2002) suggests removing seed heads to slow its spread. \"Since it seeds several times a year, vigilance is required. The only way to prevent future seed production and to reduce the threat of wildfire is to remove all C. setaceus, pulling them up by hand or digging them out with a shovel or crowbar. Disposing of the entire plant after removal will eliminate seeds caught in the leaves at the base of the plant.\"
Chemical: Extensive infestations of fountain grass are probably best controlled with the help of herbicides, especially those with some systemic activity. Informations on Cenchrus setaceus has been recorded for the following locations. Click on the name for additional informations. Benton, N. 1998. 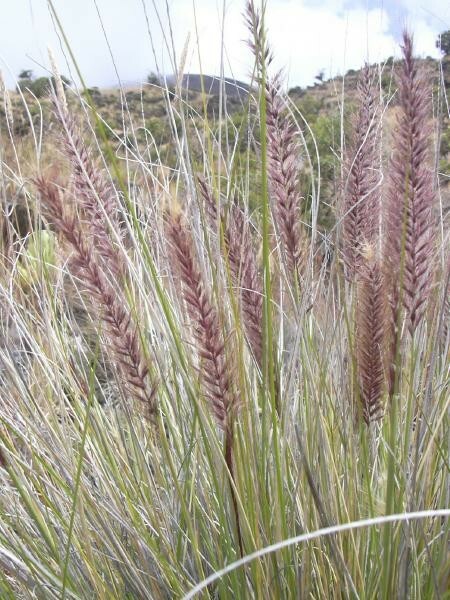 Fountain grass Plant Conservation Alliance, Alien Plant Working Group [Online Database]. Summary: Contains information on description, native range, impacts, United States range, habitat, reproduction and dispersal methods, and control methods. Available from: http://www.nps.gov/plants/alien/fact/pese1.htm [Accessed 3 November 2003]. Summary: This page contains information on description, impacts, origin, use and alternative plants, control methods. Available from: http://www.hear.org/pier/species/pennisetum_setaceum.htm [Accessed 5 February 2003]. Florence J., Chevillotte H., Ollier C. & Meyer J.-Y. 2007. Pennisetum setaceum Base de donn�es botaniques Nadeaud de l Herbier de la Polyn�sie fran�aise (PAP). Space, J.C., B.M. Waterhouse, J.E. Miles, J. Tiobech and K. Rengulbai. 2003. Report to the Republic of Palau on invasive plant species of environmental concern. USDA Forest Service, Honolulu. 179 pp.